This artist has used tint in art to create light shades of blue appropriate for the sky. To tint art is is the process of adding white pigment to a color to lighten it. It is the opposite of shading, or adding black pigment to a color to darken it. 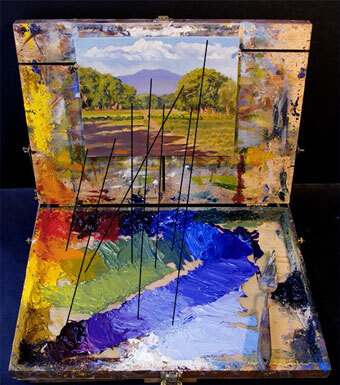 Never begin color mixing without knowing the tinting strength of the hues with which you're working. This is because colors that seem very similar will behave very differently when mixed. For instance, mars black looks exactly the same as ivory black to the untrained eye, but has triple the tinting strength.